If you want to take your SEO to the next level – or even keep up – in 2018 and beyond, then you need to understand how artificial intelligence (AI) is shaping SEO, and how you can use this knowledge to boost your rankings. Up until recently, search engine algorithms were entirely hand-coded by engineers but this has its limitations, not least because of the sheer size of the task and the potential for human error. Artificial intelligence such as speech recognition and image classification software has helped to pave the way for integrating ‘machine learning’ into search engine algorithms. Now new technologies are enabling engineers to push the boundaries even further. 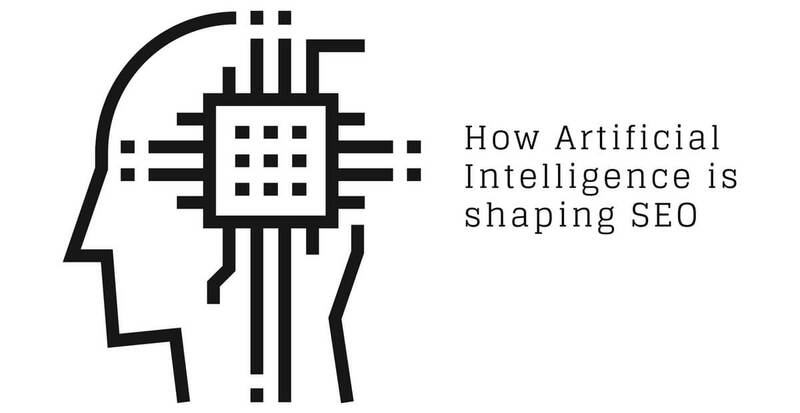 Artificial intelligence presents an opportunity to create an algorithm that learns from the behaviour of searchers and, ultimately, refines itself with minimal human input, if any. With the help of AI, search engines can consider factors such as your location, your search history, your favourite websites, and what other users click on for a similar query to give you the most appropriate search results for your individual needs. The AI can then analyse your behaviour in response to a particular search and how you interact with the results, and then improve what it offers the next time someone makes the same search. Machine learning isn’t just about accuracy though. More and more of us are going online without a screen. The popularity of virtual assistants and devices like Google Home or Amazon Echo – and indeed ‘the internet of things’ – means that people are increasingly using their voices to search. Even with a screen in front of us, it’s far less hassle to make a voice search than to do a text search. Stats from comScore referenced at the Location World event in 2016 showed that 40% of adults now use voice searches at least once a day and, by 2020, 50% of all searches will be voice searches. This is changing the face of SEO. When people use voice search, they are more likely to use conversational, natural language than the ‘searchese’ language of traditional searches. They’re also much more likely to ask questions, e.g. Who will win this year’s Oscars? or Where is the best seafood restaurant near me? As we can see from these two examples alone, the questions we ask with a voice search often assume that the search engine has a certain amount of understanding of the context of our search. To tell us where the best local seafood restaurant is, a search engine must understand our current location and what factors people normally consider when rating something ‘the best’. 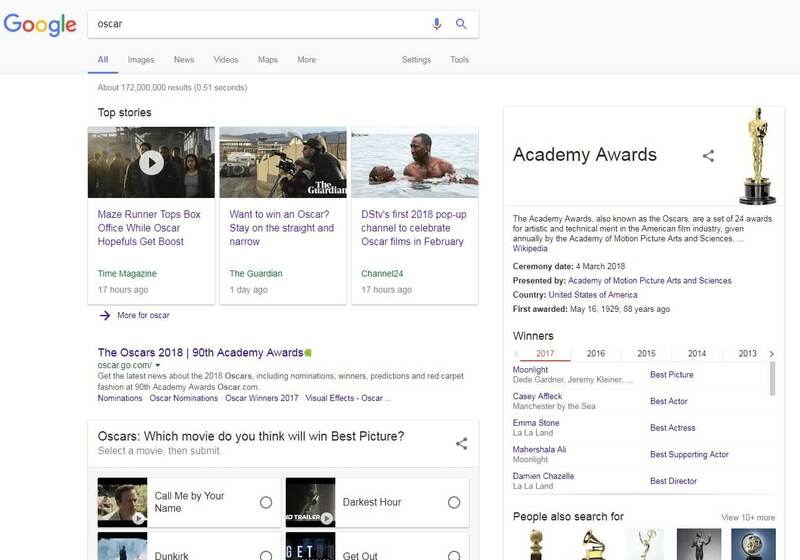 To give us the predicted winners for this year’s Oscars, the search engine must understand that the Oscars are an awards ceremony and that ‘this year’ is 2018. It will probably also realise that we’re looking for the most well-known categories like Best Actor/Actress, Best Picture or Best Director. 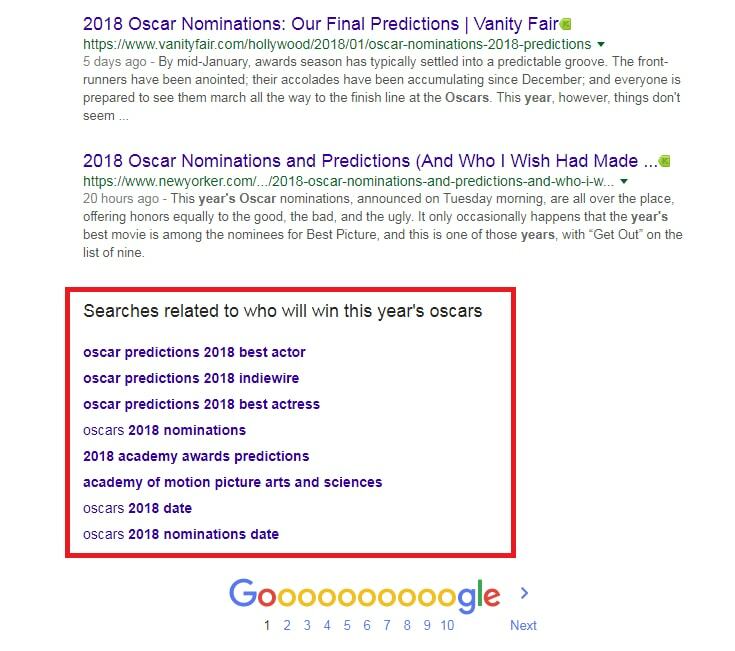 From the screen grab above, we can see that the voice search for ‘Who will win this year’s Oscars?’ brings up the exact information we’re seeking without us having to enter a search term like ‘Predicted Oscar winners 2018’. The artificial intelligence understands that they both mean the same thing. The related search queries feature at the bottom of page (pictured above) is designed to help you further by showing what other people have searched for along the same lines, just in case the search results don’t reflect what you were really looking for. Another thing to consider is that, when people make a voice search and don’t have a screen to view the results, they expect to hear just one answer to their question. To respond to voice searches accurately, AI helps the search engines source the most accurate and relevant answer to the question that has been asked. This will be the only answer a virtual assistant like Google Home gives you in response to your query. The arrival of the Google Answer Box that appears at the top of search results was an early sign of how important question-driven voice searches would become. If you can create content that perfectly answers a specific question, people won’t even need to read through an article to get the information they need. It will be there in the Google Answer Box, which is a fantastic time saver for anyone using a virtual assistant and a great way to get to the top of SERPs. Having looked at how AI is shaping SEO more broadly, let’s take a peek into how Google – the world’s most popular search engine – is using machine learning to deliver better search results. Meet Google’s deep learning AI algorithm, RankBrain. In March 2016, Google confirmed that RankBrain is the third most important ranking signal behind links and content. Although engineers continue to code at Google, RankBrain gives its own input to algorithms and tweaks the codes depending on how searchers interact with SERPs for different keywords. It does this by analysing the behaviour to the searcher. A positive response – i.e. the searcher goes to a page and stays there – means that the latest tweaks to the algorithm stay, while a negative response – such as the searcher quickly refining their search – means that RankBrain discards the changes. In tests, RankBrain has been 10% more accurate than engineers when asked to find the best page for a keyword. Where it represents an exciting frontier for incorporating AI into searches is that RankBrain is able to turn keywords into concepts and then look for web pages that cover the concept rather than just the target keyword. It recognises that people use different words and terms to describe the same concepts. RankBrain relies on certain signals about the user experience to determine how satisfied searchers are with the SERPs presented to them by Google. What is the difference between a high bounce rate and pogo sticking? As you probably know, a bounce rate is the percentage of visitors who visit a single page on a website and then leave. A high bounce rate isn’t necessarily a bad signal, especially if it’s coupled with high dwell time. This is because searchers might find everything they need on the one page. They might share it, bookmark it and not go anywhere else, simply because the page perfectly answers their query. With this in mind, RankBrain looks for ‘pogo sticking’, which is almost always a bad sign. This is when someone performs a search, clicks on a result, spends a matter of seconds (typically five or less) on the destination web page, goes back to the SERPs and clicks on a different result. This is a signal to RankBrain that the content of the visited page is bad in some way. If RankBrain sees that people are always pogo sticking away from your website, your rankings will quickly go down. Also, if RankBrain notices that people are pogo sticking across multiple websites from a particular SERP, it will recognise that the algorithm may not have given the most appropriate results and will adjust it accordingly. It may also downgrade the rankings of the websites listed the next time the same keyword is used in a search. What are the reasons for pogo sticking? On the flipside, if RankBrain notices that a searcher has been pogo sticking from other sites but then they stay on yours, this will be a signal to rank your site higher the next time the same keyword is searched, while downgrading the other listings. If you do have pages on your website that consistently have a high bounce rate with low dwell time, the chances are that searchers are pogo sticking away from your site. You will want to revise these pages as a matter of urgency. We used to have to optimise many pages of a website for many different but closely related phrases to have a chance to rank well for all of the relevant search terms. The advice was to focus on long-tail keywords that are likely to bring in highly relevant traffic with low competition. The go-to approach was the more pages on your website, the better it will be for your SEO. But this left websites feeling bloated and repetitive. It also made it hard for Google to know which page should be prioritised in SERPs. Machine learning and algorithms like RankBrain are changing how we use keywords forever. Dare I say that long-tail keywords are dead? AI enables search engines to understand that when you write about ‘how to convert to HTTPS’, you also mean concepts such as ‘website security’, ‘Hypertext Transfer Protocol’ and ‘data protection’. Therefore, one web page can rank for many different but related keywords. 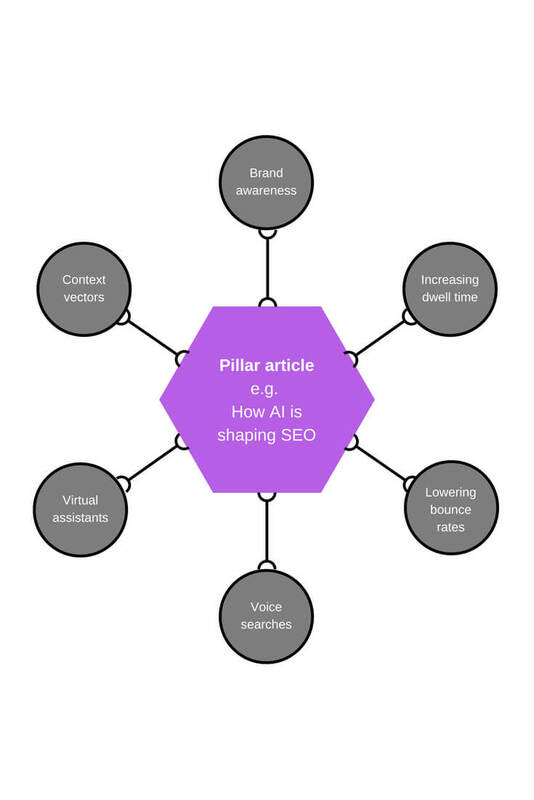 In the world of AI search, medium-tail keywords are better – these are the so-called ‘middle of the pack’ search terms that are not too generic or too specific, but accurately describe the overarching concept or topic of an article. My advice is to still have one focus key or phrase per page but to make it medium tail. And remember that keyword density doesn’t matter. For your content to rank well with RankBrain, it needs to reflect search intent and context, and give searchers high quality, high-value information. As we’ve seen above, the rise of voice searches means that we’re talking to search engines in a more conversational manner. Our human brains allow us to understand the context of different statements and questions. We may hear a colloquialism for the first time but still be able to take a good guess at the meaning based on similar words we’ve heard or the context of the conversation. But, in the past, this would be unfathomable to search engines. Google gives the following example: imagine someone searches for the word ‘horse’ – they could mean an animal, a carpenter’s woodworking stand, or a piece of gymnastic equipment. Without understanding the context of a search, how could a search engine return the most relevant results? This is where context vectors come into play. In September 2016, Google was granted a patent that focuses on how to more effectively organise and index information using ‘context vectors’ to better understand how words are being used. An excellent article from Bill Slawski of SEO by the Sea explains Google’s context vector patent further. If we go back to the ‘Oscar’ example I used at the beginning of this article, we can understand a bit more about context. If I type in the word ‘Oscar’, the returned SERP focuses entirely on the forthcoming awards ceremony. Now, I could have wanted to know more about the meaning of the name ‘Oscar’, the famous writer Oscar Wild or even Oscar the Grouch. 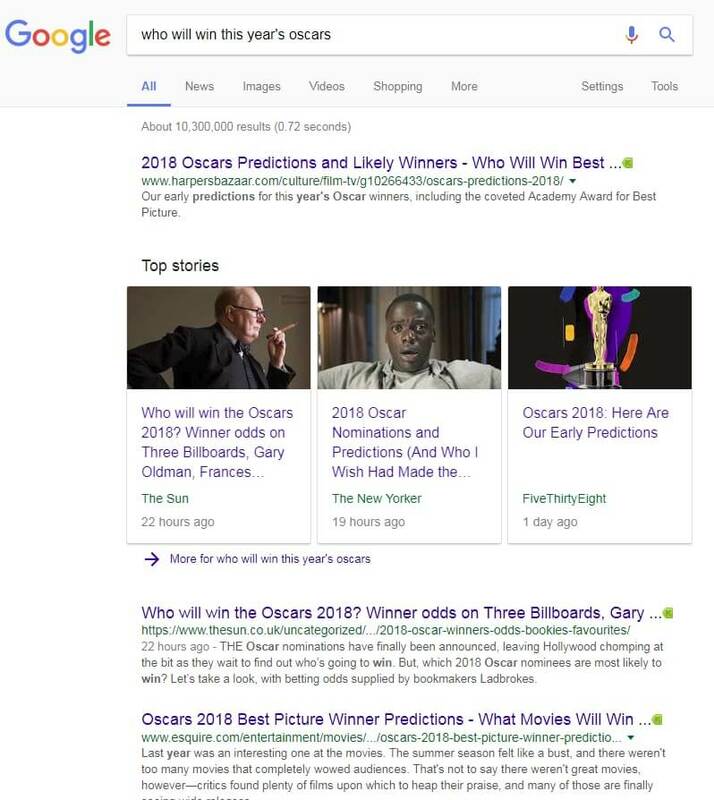 But, given that the Oscars Award Ceremony is little more than a month away at the time of writing and I’ve already searched for ‘Who will win this year’s Oscars?’, as well as the fact that lots of other people are searching for the same thing and many news articles are being written about the awards, Google has decided that – within this context – my search is most likely to relate to the awards ceremony. This is how context vectors are helping to return more relevant search results. Are context vectors the same as Latent Semantic Indexing? Many SEO commentators claim that Google uses Latent Semantic Indexing (LSI) technology to help understand the context of web pages and return them in SERPs. However, this is a major area of debate. Personally, I tend to agree with Bill Slawski who, in another article, discusses why it might be incorrect to say that Google uses Latent Semantic Indexing technology to inform search results. I think we should steer clear of slavishly peppering our content with LSI keywords. However, Google does like some semantic technologies, such as Schema Markup, so you might want to explore this further. Overall though, your focus should be on creating clear, relevant content that fully recognises the search intent of someone looking for it. If you do that, you will find yourself naturally including synonyms and semantic phrases, as well as creating context. Based on the UX signals that RankBrain looks at, I’ve put together some hints and tips to help your web pages rank well with AI algorithms. RankBrain looks at the percentage of searchers who see your web pages in SERPs and decide to click through because the listing looks relevant to their needs. This is the organic clickthrough rate (CTR). People respond to emotions and to benefits over factual, non-emotive titles. If we consider these two titles: How to manage a budget or How to survive (and even thrive) in a recession, the chances are that option two will attract for more clicks than option one because the emotional and practical benefits are clear. Some words pack more of a punch than others – these are commonly known as ‘power’ words. Writers, journalists and speechwriters love them because they are the words that take the listener or reader on an emotional journey. I found a fantastic list of power words over on SmartBlogger – try sprinkling some of these through your titles and meta data and see what happens to your CTRs. Although list posts are ever-popular, they’re not the only way you can incorporate numbers into your SEO titles and headings. One successful technique is to use numbers to illustrate measurable outcomes for actioning the advice an article contains, e.g. Try the 10 headline hacks that brought a million new readers to our blog or How to get 100 new Facebook likers in just 14 days (without advertising). Research shows that SEO titles/headings that include brackets perform 33 times better than those without brackets. Even a title like How to write better headlines [Infographic] is likely to attract more clicks because it has information in parentheses. Although Google tells us that the meta description isn’t a direct ranking signal, it can certainly affect your organic CTRs from SERPs. Each meta description you write should be a maximum of 150-160 characters that tell searchers exactly why they will benefit from clicking on your result over all the others. This should act like a call to action that reflects the search intent for the appropriate page. Once you’re clear on the overarching topic that a web page is about, it’s important to include it – and related terms – in the meta data. Google will highlight exact keyword matches in bold in SERPs, which helps to show at a glance that your content is relevant. Research such as Moz’s Ranking Correlation Study shows a direct correlation between high rankings and low bounce rates, and vice versa. Therefore, to improve the rankings of your site, you need to bring down the bounce rate and increase the dwell time on your site. RankBrain views these as important signals. The fold is the point of the screen at which people need to scroll down to be able to read more. A current trend is to have large header images on websites but this may actually be driving bounce rates up. People want to see that they’re on the right web page at a glance. If they have to scroll down to below the fold before the article gets underway, it can trigger a bounce. It’s better to put the really relevant information at the top of the page, well above the fold. Again, people can be put off by long introductions that don’t make the topic of a web page immediately clear. Try to keep your intros short and to the point. Long, in-depth content takes longer to read, which means that it can drive up dwell time. Of course, the content needs to be good to keep people reading, so long content on its own isn’t enough to guarantee people will stick around. The aim of your long content should be to provide great value to your audience. You can give a lot more helpful information in a 3,000-word blog than you can a 300-word blog. And with more information in one place, people are likely to take notes as they read, re-read sections, link back to your content and generally engage at a deeper level. These are all good signals to Google. That being said, a 3,000-word article can look pretty daunting on a screen. When you’re writing for online, it’s crucial to break up the copy into shorter paragraphs, with plenty of subheadings, pictures and bullet points to create interest and make the article easier to skim read. Brian Dean of Backlinko says that he uses a sub-header every 200 words. Again, emotive language in sub-headers is best. My prediction is that you’ll hear a lot more about topic clusters in 2018 and beyond. Topic clusters are an SEO strategy that focuses on topics instead of keywords. As we’ve touched on earlier in this article, in past SEO models you would write lots of different pages to cover similar keywords in the hope of bringing traffic in for different search terms. With the topic cluster model, you have one larger piece of content for each broad topic you cover (known as the ‘pillar’ content) – this broadly outlines the topic. Then you create other pages of ‘cluster content’ that focus on different aspects of the broad topic. The pillar links to each cluster page and the cluster pages link back to the pillar (each time with the same hyperlinked keyword). This signals to RankBrain that there’s a semantic relationship between the content. When one page performs well, it boosts the performance of the entire linked cluster. My advice is to go back through your content and make a note of the overarching topics/themes (your pillars) and then the articles that fit under each pillar. For example, I could turn this blog into pillar content about artificial intelligence, then have cluster content (i.e. individual blogs) about context vectors, virtual assistants, natural language searching, brand awareness, and more. If a page talks about one topic in-depth, it’s not a pillar page. If it touches on lots of different related topics, it is a pillar page. Research what your competitors are talking about – is there a gap in the knowledge they’re sharing or do you have a different perspective? Could this be a new pillar or inspire ideas for some cluster topics? People are more likely to click on a search result from a brand they recognise – in fact, research from Search Engine Land and SurveyMonkey shows that 70% of consumers look for known retailers in searches. This shows that brand awareness significantly influences organic clickthrough rates and traffic volumes. I have a feeling that we are only just beginning to scratch the surface of how AI will shape SEO in the future. Conduct a content audit to identify your content pillars and clusters. Rewrite the meta data using the tips outlined above. Update and refresh your older content and show how it’s still relevant. Encourage customers to leave reviews, especially on your Google My Business page – people often use natural language in their reviews, e.g. “This place has the most amazing vegetarian food at a great price”. A review worded like this would potentially appear in a search result for “where’s the best vegetarian restaurant on a budget?” This creates another avenue to get your business found by voice searches. If you find value in the information that I share a review on our SEO+ Google My Business page would be very much appreciated. Optimise your visual content to help AI understand its context. Find influencers from within your niche/industry and talk to them about linking opportunities – RankBrain tends to expect backlinks to come from within the same category or industry, rather than backlinks that seem irrelevant to your business. I hope I’ve been able to give you some insight into how AI and machine learning are shaping the future of SEO, and what we can do to stay ahead of the game. Personally, I can’t wait to see what the future holds. I think it will enhance the user experience enormously to be able to search using natural language and tap into a broader range of well-crafted resources that cover specific topics. What tips do you think you’ll put into action first? How do you think machine learning will affect your SEO strategy? Finally, I’ve put together a list of some of the fantastic resources that I found while researching this article. I hope you find them of interest. If you enjoyed this post and found it helpful we’d love it if you shared it – thank you, it’s much appreciated. Hazel Jarrett, SEO Consultant and founder of SEO+, helps businesses attract and convert website visitors. Fantastic post! Very interesting. I know AI has been seeping into so many applications and you really educated me on how Google is using it. I saw the “Answer box” but wasn’t really aware of it. I like the suggestion of seeing what the questions are and writing content in response.. very interesting .. thank you! Thank you Lesly. Great that you found it interesting. A Well written text. Good job. I like how you made a good point on pillars and clusters. a really good post, and an amazing subject. There is a lot to learn and experience about this artificial intelligence Google is using.You made me aware of new things. I will look out for it to learn more. I agree with you Erika, Artificial Intelligence and how it impacts SEO is a huge topic. I’m pleased you found my article helpful. AI shapes everything. In many ways, I do think that it is very helpful but I also think that it has great potential for danger. At any rate, I do believe that this post is very helpful and thought-provoking. Thanks for commenting Elise. I’d love to hear more about why you think AI has great potential for danger. I liked the pillar page “If it touches on lots of different related topics it is a pillar page.” information. Will go over all of this and share it too. I posted to your Google My Business page. Hi Kathryn, thank you for the comment, the share and the lovely review on our Google My Business page. Very much appreciated. Thanks for the tips. I’m learning more about Dwell Time and Rank Brain. Long-tail dead? Good! Medium is easier. Bookmarked! Great that you found value, Janice. I have bookmarked this post. Every time I read this post on RankBrain & AI, it gives me with a new idea. AI is and will impact the SEO industry. Thanks for the great insights and suggestions, this will really help webmasters and SEOs to update their strategies. Thank you Uttam. It’s a massive subject, and I agree, it will have a big impact on SEO. I think this is my first time here and what I just read is a mind-blowing piece. We have not choice. Technology is moving ahead with every minute that dies out. We must update or be left behind. Good and detailed post, really. What a nice article. it is very researched information about artificial intelligence SEO. I am here to read Rankbrain. Great experience and learned a lot. I think pogo sticking is a problem for bloggers. It gives more negative impact on SERP for your blog. How can we overcome this problem? If anyone right interesting or clickable SEO tile than it will not cover all SEO factor. Share your expert opinion on this issue.